#1. Lying is lying and, let's face it, there's nothing good about it. Why were the food network executives in their confrontation with Jag so obsequious, to the point of hugging him at the end? You have got to be kidding me. Lying about his military history was bad enough, not to mention that he apparently did not even graduate from the New York Restaurant School. If I were an employer and had found out that an applicant I was interviewed had lied, I can assure you I would not be hugging him and reassuring him that "many doors would open up for me in the future." For a station that is as PR conscious as the Food Network (so much so that they devote the whole show to radio, print and tv exposure), shame on them for sending out the message that lying is OK, it won't affect your future career opportunities! (except, of course, with us!) There are times when it is definitely not in order to kiss and make up, and this was one of them. #2. Has no one heard of a little thing called "background checks?" It seems to me that knowing that 12 finalists were going to be appearing on television, someone on staff at the Food Network would have the wherewithal to say, hey, we should check out these people's applications, before the last 2 weeks of the show. Do they not have staff there? How about an intern, I bet they would do it for free. In fact, I would do it for free. #3. Why was Jag chosen over Amy to begin with? I don't believe it was because he was a minority, as I have read on many blogs, as several minorities were eliminated early on. He had been alienating everyone from the start with his temper tantrums, and completely messed up the Iron Chef challenge, while Amy had been doing great, performing well in front of the camera and staying organized, despite one major meltdown a few weeks ago. 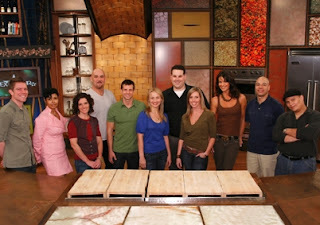 Jag did better on the Rachael Ray show, but not that much better. Plus, he continued to be evasive about his past, and now we know why. I have to say I vote NO to Rory. She just plain irritates me and comes off as phony. She keeps trying to pretend she is from the south so she can claim a "blue collar cooking" theme. For one thing, she is from New Jersey and moved to Texas apparently to be with her boyfriend. For another, who in their right mind would think that the description "blue collar" cooking would excite anyone? Do people walk around saying, "gee, I'm in the mood for some blue collar cooking?" I don't think so. I don't know about you, but this whole Food Network Star season leaves a bad taste in my mouth. Time to change the channel.